Lacinato (Dinosaur) kale growing inside a hoop house during a cold Michigan winter. Here’s another healthy green smoothie featuring my favorite green leafy veggie. Some people find kale too bitter (try kale chips), but not me, I like a little bitterness. If you live in a temperate climate and can get your hands on kale grown outdoors in colder weather you’ll find it’s more pleasing to the picky palate – after a good frost kale’s leaves become much sweeter. 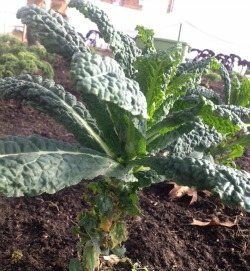 As is the case with other Brassicas, kale increases the amount of sugar inside its leaves to lower the temperature at which freezing begins. Pretty cool survival mechanism, eh? Sweetness and bitterness aside, kale provides these key health benefits, which make it an excellent veggie to green your smoothie with. Lucky for me my local CSA has hoop houses that allow them to grow kale all winter long. If you can’t find sweeter kale, or do but it’s still too bitter, make sure to use a very ripe banana and/or plenty of sweetener. Enjoy! I’d love to know if you tried this killer kale smoothie – please do tell in the comments below. Happy Blending! We grow kale in our garden and I prefer to eat it in smoothies (too bitter as a standalone item). This is my favorite kale recipe on this site. We love to add frozen blueberries to this one. Kudos for growing kale in your garden. Nice to hear this smoothie has helped you tame the bitterness. When you’re not blending kale, try sauteing in butter, lard, or tallow with a little garlic and sea salt. Excellent! I know a smoothie is worthy when it passes the “Amber test” :) Love all the add-ons. Hi Ryan. I want to try and vary the greens in my smoothies, but also want to avoid wasting veg that isn’t used. I was thinking of maybe making green veggie ice cubes, but I’m not sure if kale, spinach etc would need to be steamed first, before blending and freezing them, or just freeze them raw. I would like to increase the greens in my diet, and smoothies seem a great way to do that. What are your thoughts? That’s a great idea. This time of year when greens are plentiful I saute and freeze them for the winter months. For smoothies I would blanch (steam or water) the greens and then freeze. Ryan, that’s great, thanks. I confess I’m not a huge fan of kale on it’s own (perhaps from when we used to grow our own veg and seemed to have kale with every meal)!! But these smoothies sound great, and even better, have discovered a local source of organically grown veg – collecting our first order tomorrow. Will steam them, as suggested. Cheers! I came across this article written by a pharmacist. It all sounds illogical. any thoughts? Too long to post. Even the comments are confused. Love this recipie, my 5 year old daughter won’t eat kale alone but is crazy for this smoothie. I add a few tablespoons of yoghurt as well. Nice to hear you and your daughter love this recipe. Thanks for sharing, Dee.